At present, 269 sq ft houses are provided under the slum redevelopment projects in the city. 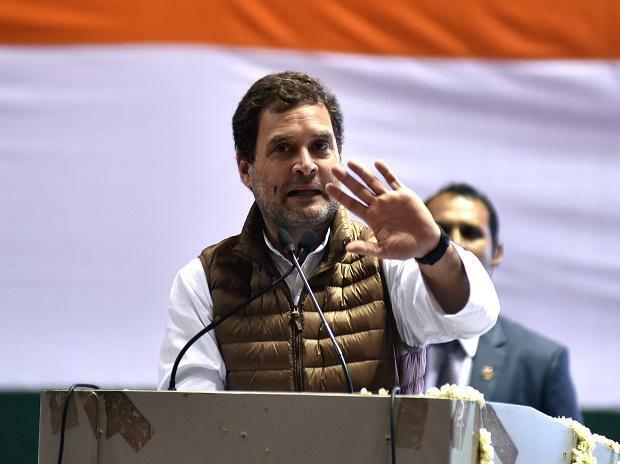 Congress president Rahul Gandhi announced Friday that his party would give 500 sq ft houses to slum-dwellers in Mumbai within ten days if voted to power in the Lok Sabha elections. Gandhi addressed a rally at MMRDA grounds here. Promising 500 sq ft houses, Gandhi said, "I am saying in ten days, but I assure you it will do done within two days. Describing Mumbai as the soul of India, Gandhi said Prime Minister Narendra Modi speaks of developing 100 'smart cities', but Mumbaiwas a smart city and its strength and potential needs to be recognised. Mumbai is "city of peace and brotherhood" which gives direction to the country, the Congress chief said. Paying tributes to the CRPF jawans killed in the Pulwama terror attack, Gandhi also said he welcomes back Wing Commander Abhinandan Varthaman (who is set to be released from Pakistan's custody). Gandhi said he had challenged Modi to an open debate on corruption. "But the 'Chowkidar' is not only chor (thief) but also darpok (coward)," he said. The BJP was attacking the Constitution of India which is "your voice and does not belong to Modi or (RSS chief Mohan) Bhagwat", Gandhi said. "What was the need to remove CBI director at midnight. Planning Commission, which showed direction to the country was wound up. For the first time the RBI governor had to resign. In Chowkidar's India, Supreme Court judges hold press conference seeking justice from the people of India," he said. The media was also being controlled, Gandhi alleged. He also slammed the Kisan Samman Nidhi scheme for farmers, saying it gives only "Rs 17 per day to a farmer's family and Rs 3.5 per day to one farmer". "Is this a joke? And BJP MPs were thumping their desks for five minutes when this announcement was made during the budget, as if Modi would beatthem up if they didn't applaud," Gandhi said. "If you want to hear falsehood and 'Mann ki Baat', go to Chowkidar'smeetings. If you want to hear truth and 'kaam ki baat' (something that matters), come to us," he said, in a dig at Modi's monthly radio programe. The GSThas destroyed small traders and small and medium businesses, the Congress president said, adding, "If you come across any small and medium businessmen or traders who say they have benefited from GST, bring them to me, I would like to meet them." On the proposed grand alliance of opposition in Maharashtra, Gandhi said, "Whoeverwants to come along, Congress' doors are open.